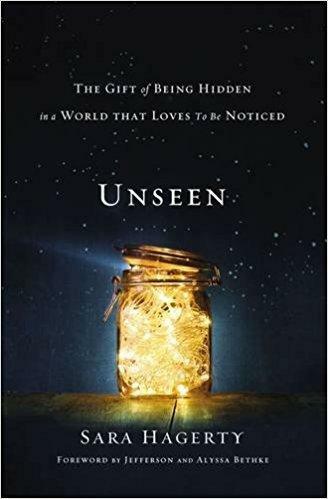 Unseen: The Gift of Being Hidden in a World That Loves to be Noticed is the second book by critically acclaimed author Sara Hagerty. Sara bases this book on Jesus’ encounter with Mary of Bethany (Matthew 26:6-13; Mark 14:3-9; John 12:1-8). As Ms. Hagerty summarizes, “God invites us, through Mary’s forever-retold story, into . 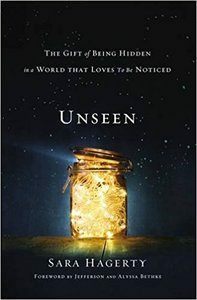 . . the kind of unhinged love that lays everything at His feet whether or not anyone else ever sees, approves, or applauds.” Thus, although we live for what’s right in front of us, God ever so gently calls us to His unseen. For craving the opinions and accolades of others breaks our gaze with God’s eyes – the only eyes to ever truly see us. So, even when no one else is looking, God sees us. In contrast, our human eyes easily betray the truth of the our story. Therefore, Sara underscores, when God hides you, everything hinges on your response. God hides you: (a) so you find Him in His hiddenness; (b) to show you His kind eyes toward you; and (c) to tell you your story. After all, God’s richer version far exceeds yours. Furthermore, God creates, roots, and grows the sweetest greatness in secret. And seen by God alone. Most noteworthy, even when you’re a mess, God’s whispering into your story, not looking away from it. It’s unnecessary, then , for you to partake in the most elusive form of hiding – that is, hiding from God. Hence, in those naked-place moments when you permit yourself to be exposed before God, He covers you with Himself. Finally, Ms. Hagerty exhorts, if we’re able to tolerate our thirst long enough, we’ll find more of God. Consequently, the thirsty thrive in God. As we acknowledge our wounds, God heals them. In addition, we learn to trust God more than we believe our fears. Where people’s opinions fail us and we can’t see through our fears, God speaks to us in the unseen places. As a result, here’s what happens when you lean into hiddenness. You see prayer more as a growing connection to God’s heart and less as getting a desired answer. When you listen in hiddenness, Sara explains, God’s thoughts reveal themselves to you. They become precious. You journey through the hidden places in expectation of victory.